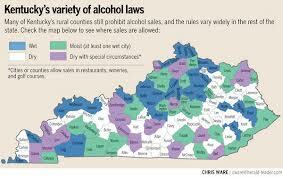 Kentucky’s seven-decade old ban on grocery stores, gas stations and other retailers selling wine and liquor is unconstitutional because it violates the equal protection clause of the Fourteenth Amendment to the Constitution, a federal judge ruled. U.S. District Judge John G. Heyburn II ordered that the ban may remain in place for the time being because there are other legal issues to sort out. Heyburn said in a nine-page opinion issued Monday that the state legislature “wanted to limit liquor sales generally … and it did so by arbitrarily distinguishing grocers from all other retailers” when the law was adopted. “Perhaps back then grocers were different from other potential alcohol vendors in some manner that rationally related to the sale of liquor and wine. If so, none of those differences appear today; most drugstores sell staples and some grocers sell prescription drugs,” Heyburn wrote.